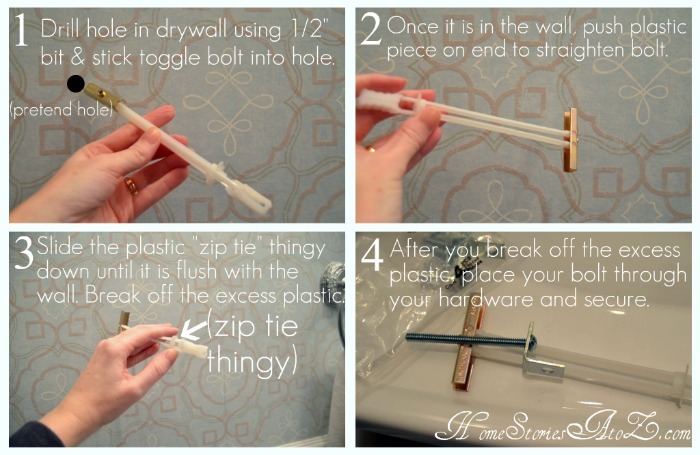 I promised you a tutorial on how we created our floating bathroom shelves! 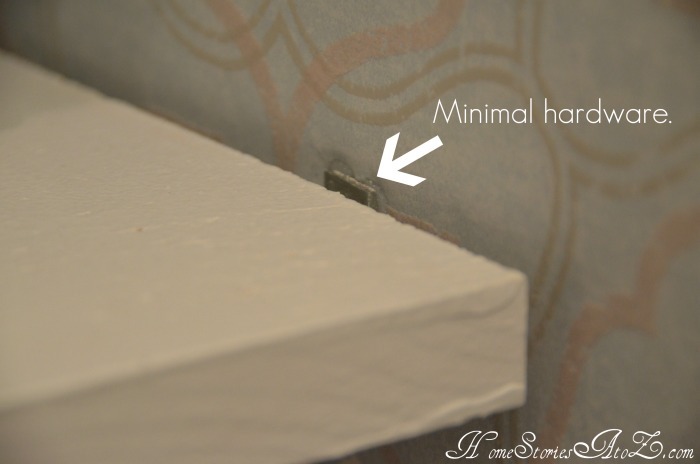 It is so incredibly easy that I swear ANYONE (yes, even you non-DIY’er) can do this! 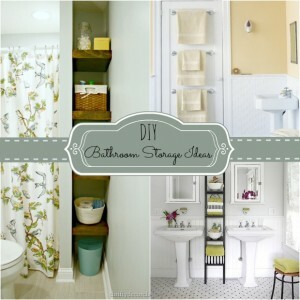 If you missed the entire bathroom reveal post, please click here to see more pictures of the entire space. 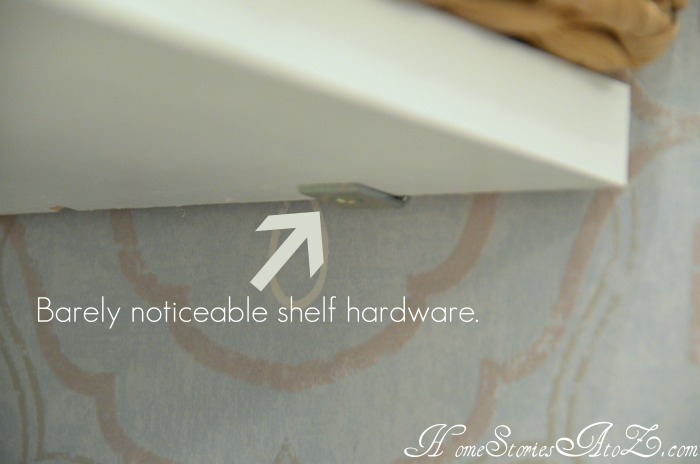 I wanted the shelves to be sturdy, but I also wanted the hardware to disappear. 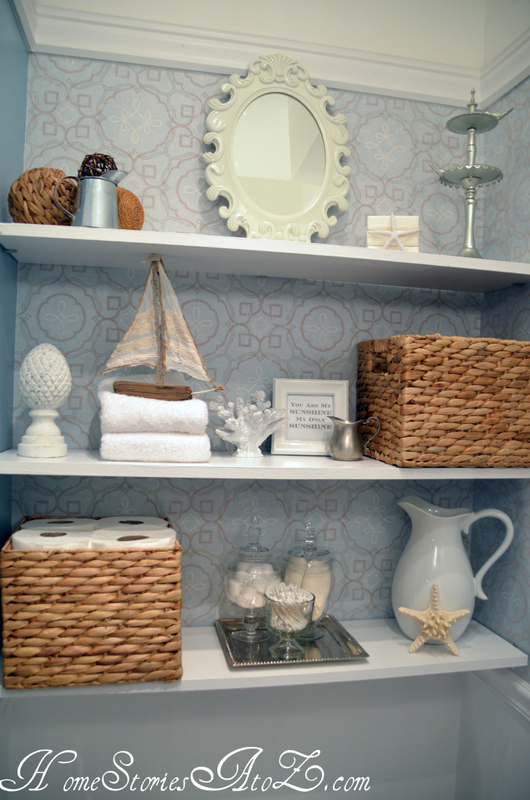 Matt suggested using three braces instead of four on each shelf and it worked out beautifully! 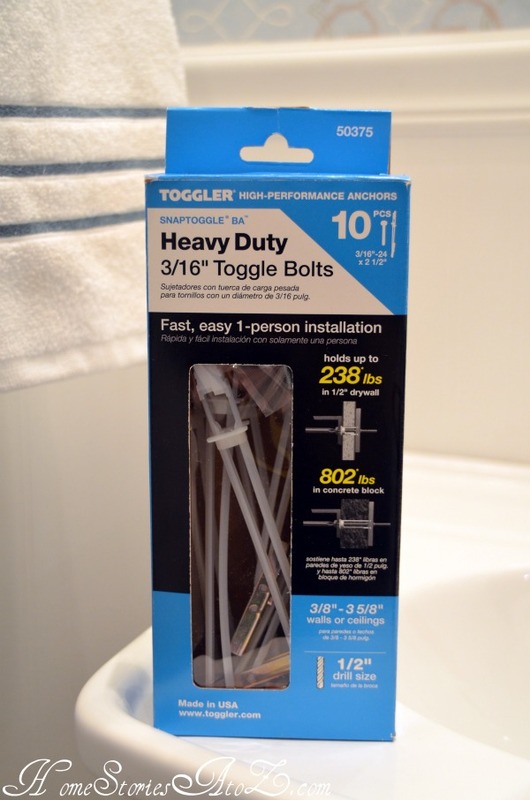 Here is your secret weapon….toggle bolts! You can find them in the hardware section of any home improvement store. They allow you to securely hang things in your drywall when a stud isn’t available. I don’t know about you, but our studs are NEVER where I need them to be….like ever. 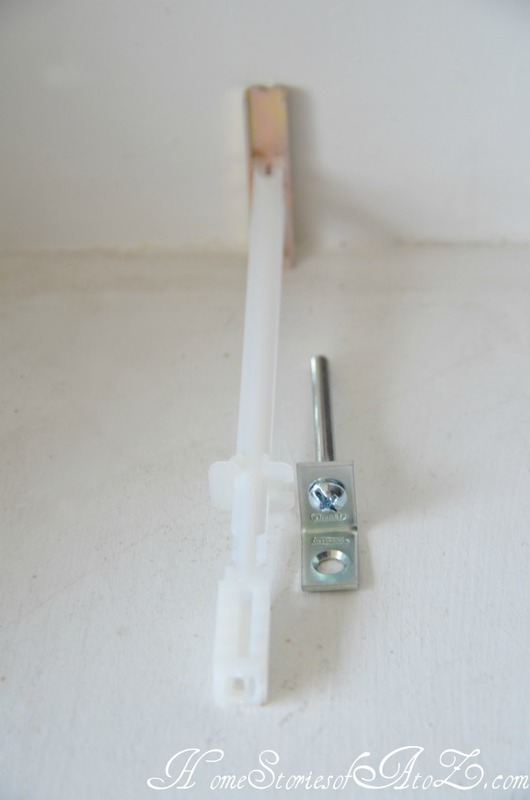 Toggle bolts work great for your permanent wall fixtures. I was too cheap to actually destroy a toggle bolt in order to show you exactly how they work so you’ll have to use your imagination. 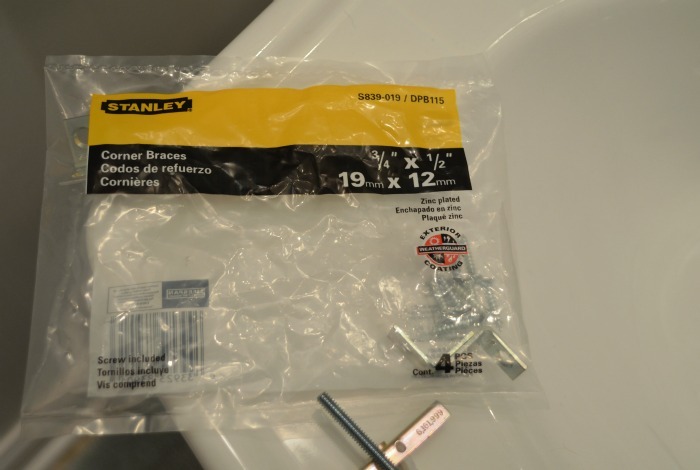 But the directions are right on the box and if you can drill a hole you can use a toggle bolt! These are the braces we used to hang each shelf. And here is a close-up of the hardware. You can barely see it! If you need to know how to use a drill, you can check out my video at the very end of this post here. Happy shelf hanging! Awesome explanation. I’m using this approach for my kitchen, putting a floating shelf above my sink. Painting a regular board gray, then sanding it a bit. I also liked the tip for painting the hardware and have them really disappear. Was reading this during my visit to Home Depot today. Thanks James! Good luck on your shelves. that’s awesome! I could do that without my husband’s help! Absolutely! No husband required for these at all. You’re welcome :). Glad it was helpful! Hi! This looks great! I will be doing this in my living room ASAP. I was just wondering about how much all of the materials cost? Hi Jessica, I really don’t remember but I’m guessing less than $50? I already had the paint on hand. Good luck! 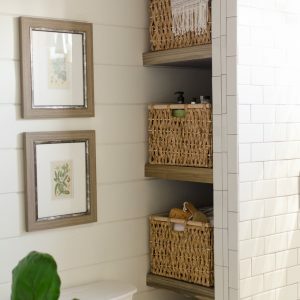 How high above the toilet did you start the first shelf and how far apart are the shelves spaced? Thank you! How deep are the shelves? I’m trying to get an idea so there is enough space to place things on it. Awesome idea. Hubby and I bought stuff this morning to build our own too. 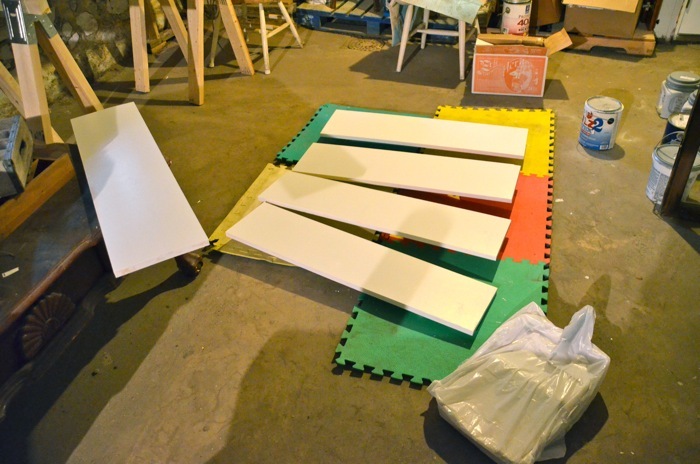 We went one step easier and found laminate boards already stained that were the perfect length! Can’t wait for them to go up tomorrow. I love this look and the directions are perfect. I also love the wallpaper!! Where can I find it and does it have a name? Thanks for sharing – it’s lovely!!! Just a suggestion: Paint the corner braces the same color as the shelves so they disappear. I will be starting a kitchen makeover soon and I will be using this for my open kitchen shelves! Thanks for sharing another great tutorial!!! Lovely, Beth! Thanks for sharing the details – you make it seem very much more doable by sharing them. Now I need to find a cubby for shelves! 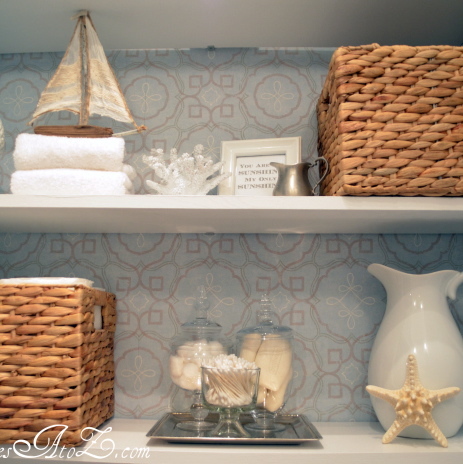 I have been trying to talk my hubby into assisting me with floating shelves… but the tutorial I found on floating shelves was MUCH more complicated. I’m so thankful that you posted this! LOVE them! Nice! I was wondering how you had done it. Do you suppose it would work in a window opening? I have a tall narrow window in our half bath, was trying to think of a cool way to have shelves there, without major visible hardware!